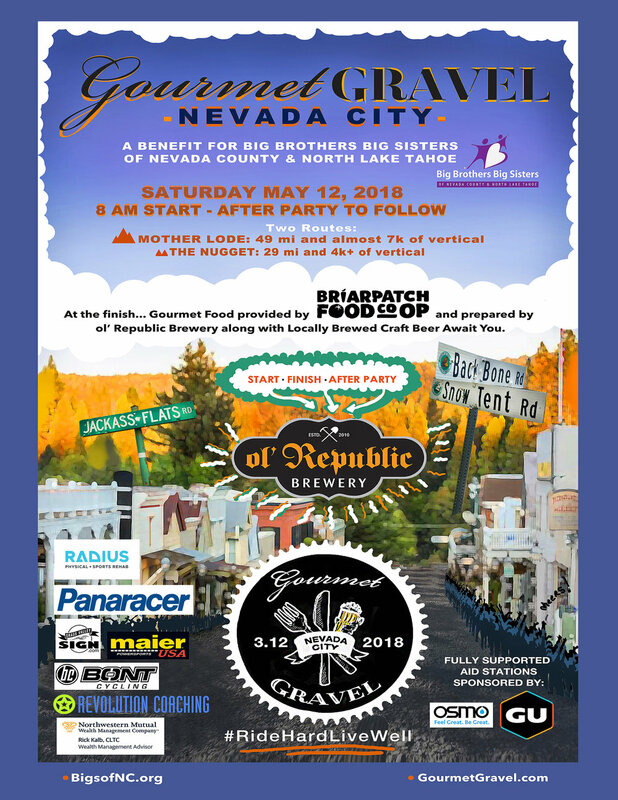 We are happy to move forward with the 2nd annual Gourmet Gravel Nevada City in partnership with Big Brothers Big Sisters of Nevada County & North Lake Tahoe and the 20th anniversary of their Miles for Mentoring ride in Historic Nevada City. YES! We Will Have Roasted & Brewed in Nevada City Foxhound Espresso & Coffee Broaster COFFEE For You All! Three Forks Bakery and Brewing Co. will be baking fresh made Cinnamon Rolls, Scones and Muffins the morning of Gourmet Gravel. Parking is frequently a challenge in our small Western Sierra Nevada town and we request that you respect the other merchants by not parking in their private lots. 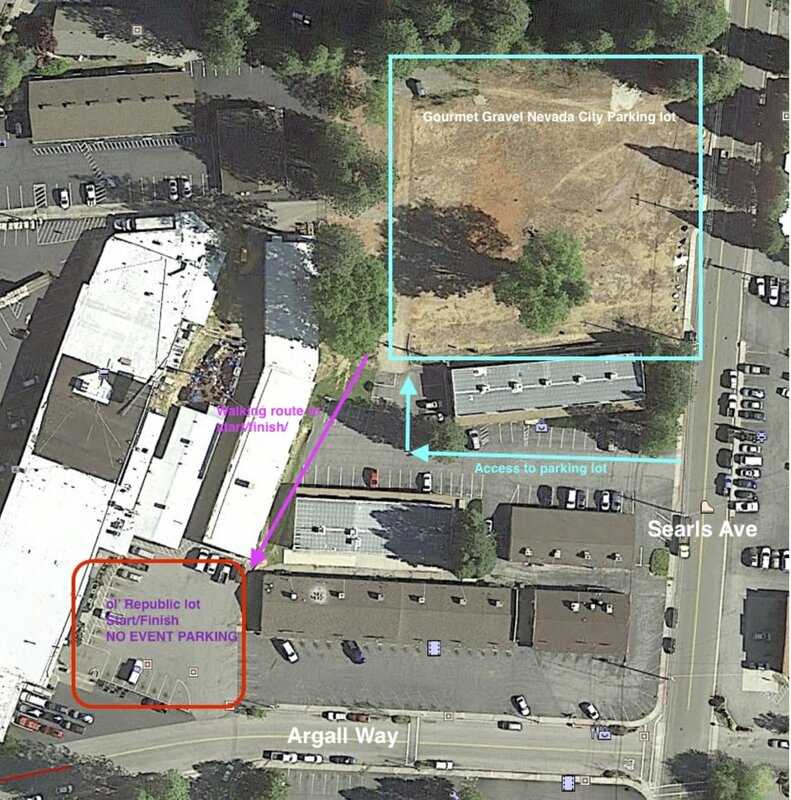 We have designated overflow parking for Gourmet Gravel Nevada City in the dirt lot behind ol' Republic Brewery as well as abundant street parking. Please DO NOT park in the California Organics, SPD Market or any other local merchant parking lots. Access to the designated lot by vehicle is not through the main lot of 'ol Republic Brewery, but rather off of Searls Ave (see map). From the dirt lot you can walk to ol' Republic. ***CAUTION***, the dirt lot does have thorns, so DO NOT ride your bike in this lot. The MOTHER LODE - 49 miles and 6,900+ ft of elevation gain/loss. A mix of paved and dirt roads with the majority being Nevada County maintained dirt roads northeast of Historic Downtown Nevada City. The MOTHERLOAD covers all of The NUGGET route. Riding in/out of Historic Downtown Nevada City the average elevation gain or loss is 150 ft per mile when riding mixed terrain. This is only an average and some sections are closer to 200 ft per mile with sustained pitches over 18%. We consistantly average between 10-12 mph on these routes. Some of the descents can be a bit challenging as far as steepness goes depending on ability level. As always, we recommend caution, especially when descending Backbone Road (MOTHER LODE route only) and Purdon Road (both routes) heading down to the second and final crossing of the Scenic South Yuba River. BIKE: Gravel bike, Cross bike or hardtail MTB. Recommend MTB if you are new to gravel or don't have a drop bar bike with appropriate gearing and tires. Road bikes discouraged due to gearing limitations and tire clearance. GEARING: Recommend at least 1:1 gearing (you will be happy about this climbing out of Purdon Crossing). We consistently ride lighter grears than 1:1 with the 1x set up using 40x42 or 42x44. With a 2x set up a 34x36 works well. You will not likely run out of gears going downhill. Gourmet Gravel Nevada City 2018 is a fully supported non-timed participation event, We will have multiple aid stations, fully staffed and stocked with the perfect mix of delicious nutrition, hydration and friendly volunteer staff. Participants who wish to have a finishing time can use Strava or similar. 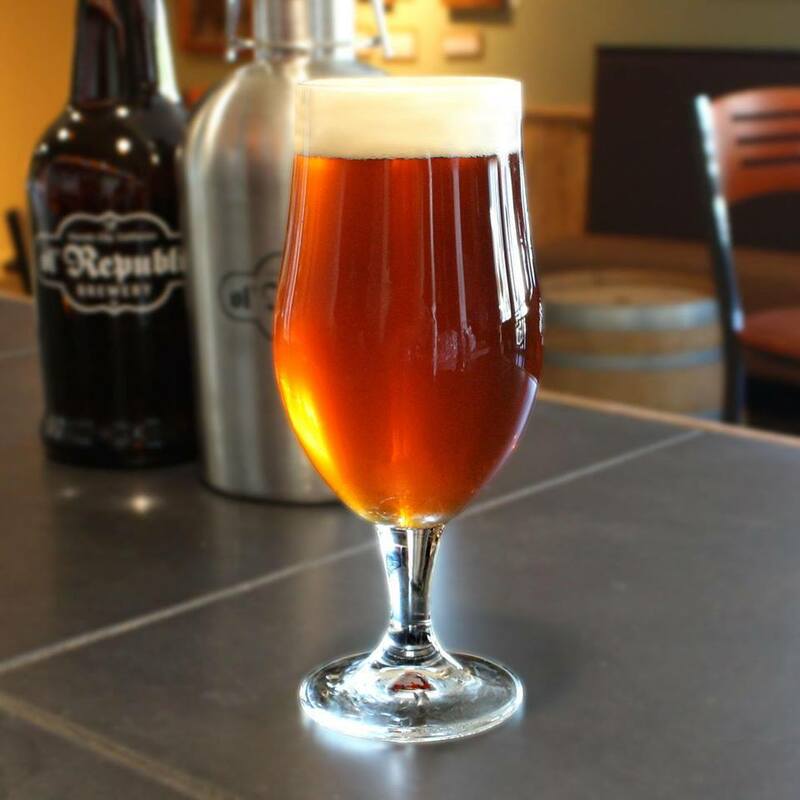 Post ride beverages provided, including Craft Beer from ol' Republic Brewery...Brewed in Nevada City, regional wine & locally sourced and produced gourmet food. We will also have nonalcoholic beverages. All paid participants will receive a complimentary beverage of their choice, along with a catered lunch.